Apple's recent flipping of the switch to allow for ad-blocking apps has sent the digital publishing world into a full-blown crisis, as the number of consumers fed up with ads that clutter and slow down websites—and doing something about it—has reached critical mass. While ad blocking has been around for years, it is now top of mind for marketers and publishers as ad blockers experience massive growth. The number of consumers using ad blockers in the U.S. increased 48 percent during the last year, according to a report commissioned by Adobe and conducted by PageFair, which estimates that ad blockers on desktop computers will cost publishers $22 billion this year. (UBS Securities puts the damage at $1 billion for mobile devices.) And with ad-blocking apps routinely among the most popular downloads for Apple's iPhone, what is a crisis could become a catastrophe. Some are quick to point the finger at the rise of sophisticated ad-targeting technology that produces intrusive ads like pop-ups and retargeted banners. 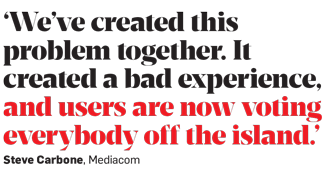 "Unfortunately, we've all created a situation or allowed a situation where we're buying ads all over the place," says Steve Carbone, managing director and head of digital and analytics at Mediacom. And yet, despite all of the hand-wringing about how much financial damage ad blockers will ultimately cause, the topic has also opened up new conversations between publishers and consumers to figure out how to fix the problem. "We try to talk to them about the value exchange, and we try to ask them what type of ads they like and don't like," says Jed Hartman, chief revenue officer at The Washington Post. 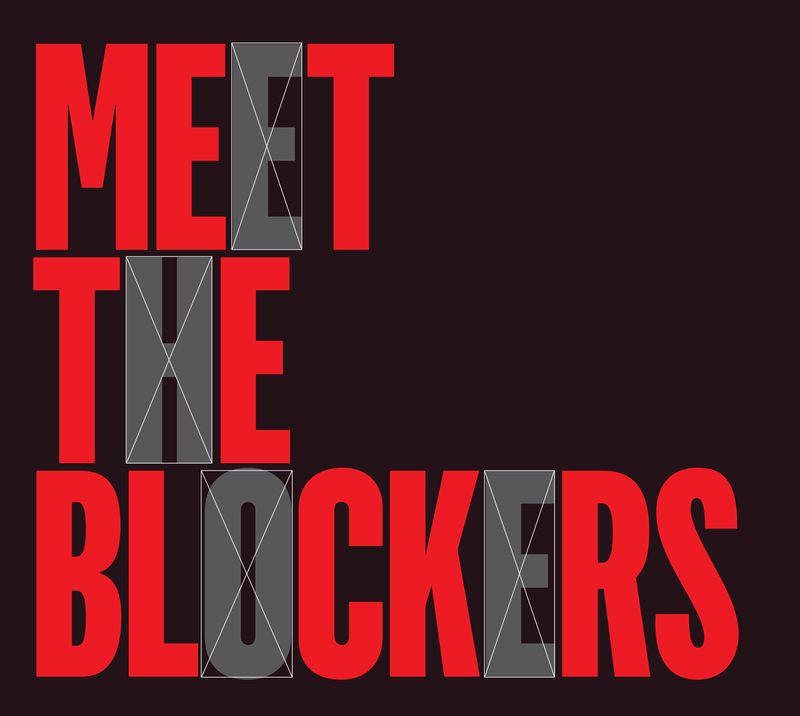 To get a closer look and a better understanding of a topic consuming the business of digital marketing, Adweek last week gathered a half-dozen representatives of publishers, agencies and makers of ad blockers to talk through the key issues. Adweek: Why has ad blocking become so popular? Jared Belsky, president, 360i: I think there have been three catalysts. First, the obvious one: Apple has taken a pretty hard-core stance that ad governance has been poor. They wanted to make some changes with the disruption of the iOS 9 browser. The second one is that more people are precious about what they're willing to receive on their device—as mobile penetration has gone up, you've hit that conflict. Lastly, consumers are smarter than ever, and many of them are aware that a big chunk of their data plan is being consumed by these ads. What's critical to understand [is that ad blocking] is not just about the percentage of people that have ad blockers but rather the percentage of quality ads that are blocked. Those are two very different things. Jed Hartman, chief revenue officer, The Washington Post: The advertising ecosystem has really gotten caught up in the capabilities—from an advertiser [and] publisher perspective—that technology has to offer. In some cases, it didn't flip this around and look at what it does to the customer experience. When I say customer, I mean audience. A lot of the innovation has not been incredibly empathetic with speed, cleanness and [data] lightness of the products. That's part of what has gotten us here. Steve Carbone, managing director and head of digital and analytics, Mediacom: The other part that has made this a big issue is the Apple [iOS 9] technology has also blocked attribution. The fact that the attribution piece is now also becoming an issue and our ability to actually track and measure has made ad blocking pop up and become a much bigger issue on our side. Ben Williams, communications and operations manager, Eyeo GmbH, maker of Adblock Plus: I think all of those things are fair points, but I don't want to overemphasize the impact that Apple's new capabilities for iOS 9 have had on ad blocking. Ad blocking has always been mainly a desktop phenomenon. We are the biggest ad blocker, and we alone have 400 million downloads of our desktop product. I don't want to take away the importance of what Apple did, but I do think that it was already quite a large phenomenon and perhaps something that a lot of people were OK with ignoring. Brian Kennish, CEO, Rocketship, maker of Adblock Fast: Inherent to what some of the folks are saying is that the ads that are being shown on the Web have just gone overboard and people don't want to see them anymore in contrast to ads in other mediums like TV and on radio. The fact is that ad blockers are going to wherever the technology allows them to go. Ad blockers are allowed on [Google] Chrome, some of the other browsers and are now allowed on iOS because they're going there. Building an ad blocker for television or radio is much more technically difficult. I s there any pushback to the narrative that the publishing and advertising community didn't realize soon enough that they were inundating consumers, particularly mobile users, with advertising? Kennish: If you gave people an easy way to block ads on TV and radio, they would block ads there, too. I'm talking about the similar sorts of percentages that you're seeing among Web users. I'm guessing that about 10 to 20 percent of Web users who have ad blockers available to them today are actually taking advantage of them. Hartman: We built a dashboard to monitor pixels per page and then look at the root of where the pixels came from and how much is from rendering the editorial page and how much is from advertising. Sometimes, the advertising [portion] is a staggering number—hundreds of pieces of code for a page. Because of that, the effect on load time is significant. That is different than just having an ad serve a purpose on its page. Some of the pixels in there are not necessary in impacting the user and perhaps collecting reasonable data to deliver smart advertising at another time. Lisa Valentino, chief revenue officer, Condé Nast Entertainment: I think that we're all getting a lot smarter about how we can speed up a load time, how many ads [work] per page. The reality is, we're probably all behind the eight ball a bit in terms of fostering real creative innovation, especially in the mobile space where most of this content is now being consumed. I haven't seen a digital or mobile piece of creative that has tugged the same way as television creative. I'm making huge generalizations here, but I do think creative is such a big part of it that we have just ignored and focused so much on the tech. As a result, we may be in a world where it's more beneficial for consumers to feel like they need to block ads. Belsky: Digital advertising has to be about utility and efficacy versus ubiquity and trickery, which is sort of what it's become about. The entire industry is predicated on a value exchange where everyone has to win—consumers, brands and publishers. But the pact has been corrupted and diluted lately with too much ubiquitous, and frankly, terrible advertising. Brands and agencies have to play a more active role—forcing the industry to have smarter, richer and better formats. Valentino: In the last two weeks, I've heard more companies saying, "Next year is all about branded content. You can't block branded content." We're getting into the branded-content business because we're great at storytelling, and we can do that for advertisers, we think, in a bigger way—not because branded content doesn't get blocked. It's unfortunate to hear that groundswell. Williams: If you're serving a native ad, it certainly can be blocked. Anything can be blocked, if the coder chooses. Valentino: It's interesting because when we look at the performance, we've actually decreased the number of ads per page. We released a number of high-impact units this summer where the performance has been off the charts. These are probably the same ads that are getting blocked because they're "larger" than average. How much of Condé Nast's traffic is getting blocked? Valentino: We don't have a public number that we're out there talking about, but I will say it's an absolute part of the conversation internally. We've spent a lot of time this year on looking at all of the bad behaviors that are going on across our network to try to make sure that we're improving the consumer experience as much as we can. By doing that, we're seeing time per page go up. We're seeing total pageviews go up. That is what the digital folks know how to do really well—it's the tech stuff. The other piece is that we've spent the last 20 years saying that we need the creatives to pay attention. The real smart creative folks out there need to think about formatting for a smartphone. That's why so much of what we're doing now is in-house because we've got to start putting that kind of stuff first in addition to all the tech work that we can do to make ourselves faster, smarter and more efficient. How much more work are you doing in-house now compared to a year or two ago?